Chandan Roy's Facebook account hacked ! 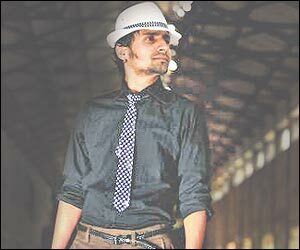 Mikhail of Kaminey, Chandan Roy Sanyal's Facebook status reads: Some tv actress Sneha Wagh keep sending me abusive messages, and SMS. It is very serious matter. Don't know what to do. "But that's not me on Facebook. My account got hacked three weeks ago and I've been unable to log in since then. In fact, I don't even know Sneha Wagh... I've not even heard of her," said Chandan. Apparently, Sneha Wagh is a television actress who essayed the role of the protagonist in a serial called Jyoti. The actor, who is currently shooting in Colombo for Deepa Mehta's Midnight's Children, added, "I'm going to lodge a complaint with the cyber crime cell once I return to Mumbai. I have uploaded some of my personal pictures on Facebook and things like these are just scary." Chandan, better be careful about your social network. You've just started out and have a long way to go!